Steve Berger, Holocaust Survivor, on the division between races in the United States today. Steve Berger is a Holocaust survivor that was born and raised in Debrecen, Hungary. In the year 1941, Jews comprised 7.3 percent of the population (Shoah Resource Center n.d.). Growing up as a Jew in Hungary, Berger has always been aware of Antisemitism. The Jewish population was separated from the rest of the population through the numerus clausus. In fact, as Berger points out, Hungary was the first country after WWI to institute the numerus clauses in universities (Berger 2017). The numerus clauses were passed, “limiting the number of Jews in institutions of higher education” (Kenez 2001). Additionally, Jewish men were removed from the Hungarian army, instead pushed into the labor services. This further separated the Jewish people from the remainder of the population. On March 12, 1938, Adolf Hitler officially announced an Anschluss between Austria and Germany (History, n.d.). The German term Anschluss means union (Encyclopedia Britannica n.d.). Hitler claimed that his desire was to unify all European countries that spoke German. Interestingly, the idea of this type of unification was initially proposed by Austrian socialists in 1919 (Low 1974, 1). Inhumanity is one of the most cruel and atrocious acts committed by human beings because of personal bias. The disregard of another individual’s life has led to one of the worst events recorded in history, the Genocide. Encompassing the Genocide during World War II into one word; it was savagery. Human lives destroyed due to the Holocaust, violating human rights, and overall eradicating liberty for the Jews. 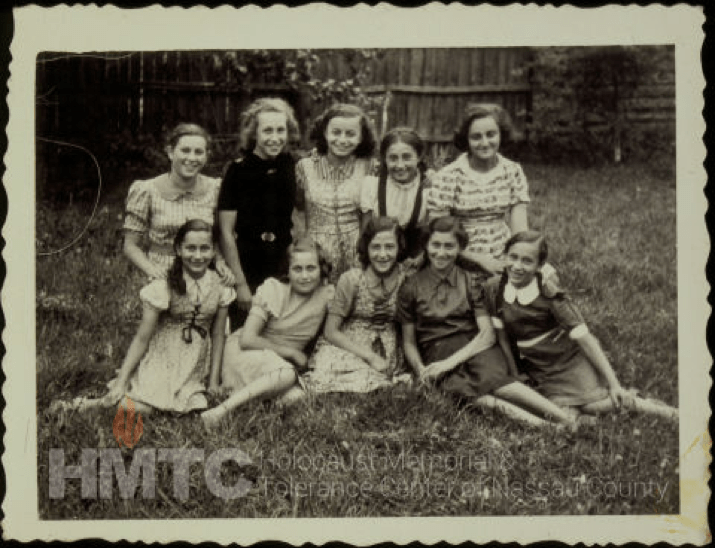 The group of young Jew girls exhibited in this image was part of Shtetl a small market town in Eastern Europe, Poland (Zollman, n.d.). This image emphasizes the direct contrast of normalcy and the horrors of the Genocide, as well highlights the millions of lives shattered because of racial prejudice. Eastern Europe, Poland held the largest Jewish population that lived before the war, and was where extermination of the Jewish population of the world collectively took place (Frontline, n.d.). On September 24, 1941, the entire Jewish populations of Ejszyszki was shot in the Jewish cemetery of Ejszyszki by the Einsatzgruppen (Yad Vashem, n.d.). The Einsatzgruppen were a special task force considered mobile killing units that operated in German-occupied Europe. These groups were actively hunting and killing Jews in many other countries occupied by the Nazis (Aktion Reinhard Camps, n.d.). Deprived of human worth, the Jews imprisoned in concentration camps; shot, starved, gassed and ultimately burned being the many torturous ways they died. 6 million European Jews murdered by the German Nazi regime, considered an inferior race, an overall threat to German racial purity and community (History, n.d.). Germans considered themselves racially superior to Jews (United States Holocaust Memorial Museum, n.d.). Based on this catastrophic event among many others that occurred throughout history, it is clear that without laws to protect human rights, those facing discriminatory persecution can suffer grave humiliation and even annihilation as was the case of European Jews. The Holocaust era was one of the most devastating events that have marked our history. Its everlasting effects will always be remembered as the Holocaust obliterated innumerable of Jewish communities in Eastern Europe. Holocaust survivor’s history can urge elected leaders to unite, take responsibility and strive for social justice, to protect the oppressed and aim to end genocide. “Einsatzgruppen.” n.d. Accessed March 26, 2018. http://www.deathcamps.org/occupation/einsatzgruppen.html. “Introduction to the Holocaust.” n.d. United States Holocaust Memorial Museum. Accessed March 26, 2018. https://www.ushmm.org/wlc/en/article.php?ModuleId=10005143. “Shtetl – The Life and Death of a Small Town and the World of Polish Jews – Shtetl.” n.d. FRONTLINE. Accessed March 26, 2018. http://www.pbs.org/wgbh/pages/frontline/shtetl/reflections/. “The Holocaust – World War II – HISTORY.com.” n.d. Accessed March 26, 2018. https://www.history.com /topics/world-war-ii/the-holocaust. “The Untold Stories. The Murder Sites of the Jews in the Occupied Territories of the Former USSR.” n.d. Accessed March 26, 2018. http://www.yadvashem.org/untoldstories/database/index.asp?cid=188. “What Were Shtetls? | My Jewish Learning.” n.d. Accessed March 26, 2018. https://www.myjewishlearning.com/article/shtetl-in-jewish-history-and-memory/.